Is my dog dying right now? Why didn’t my vet catch this earlier? How could my dog get cancer almost overnight? These three questions keep dog lovers up at night after they get the awful news that their beloved dog has cancer. That’s why Dr. Demian Dressler answers them right up front in his excellent best-selling book The Dog Cancer Survival Guide: Full Spectrum Treatments to Optimize Your Dog’s Life and Longevity. 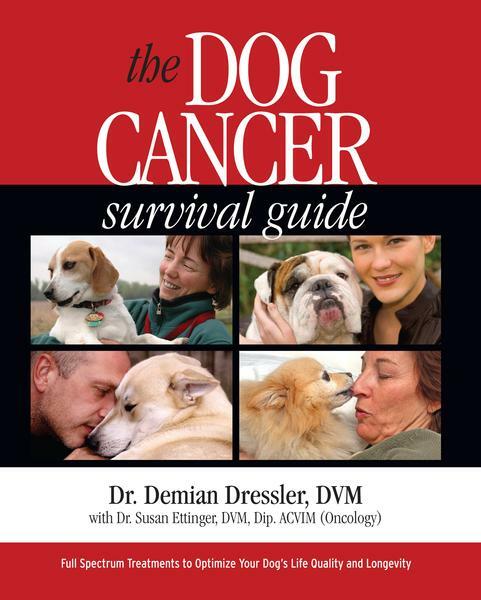 Co-authored with veterinary oncologist Dr. Susan Ettinger, it’s a must-read if you’re facing dog cancer. We’ve excerpted Chapter 3: Three Common Questions below, so you can read it and get the answer to these common questions right now. And if you want to get the full book — which covers everything from surgery to supplements, diet to diagnosis, you can get it everywhere books are sold or in our online shop. There are three questions guardians tend to ask first when they get a cancer diagnosis. Because these three questions seem to weigh on the mind and could distract you from learning anything new, I am going to answer them as best I can. How Could Cancer Happen Overnight? One of the hardest things for most guardians to grasp is how they didn’t see this coming. Many times the dog seems healthy right before she’s brought in for an evaluation. Sometimes dogs don’t seem sick at all. How did this grave illness escape your attention? The answer may surprise you: your dog may have hidden it from you. Dogs have an old, genetic program that encourages them to conceal any sign of illness, a legacy from when they ran in packs. The pack mentality oriented them toward maintaining their position in the hierarchy and defending the pack from predators. Weak dogs slow down the pack and become predators’ targets. As a result, they risk losing their rank in the hierarchy or being left behind, which is a terrible fate for a dog. A dog will do just about anything to avoid this – including behaving as if nothing is wrong for as long as she can. Despite generations of domestication, dogs still think like wild animals when they feel ill. If your dog felt sick before his diagnosis, you can bet he did everything he could to make you think he was just fine. When a dog can no longer hide his symptoms, he gives up trying and seems to get sick overnight. This is called decompensation, and it often occurs just before the guardian takes the dog to the vet. This leads me to the second reason that cancer seems to sneak up on us: our reliance upon sight. Humans use sight as their primary information-gathering sense. We see our dog eating, walking, playing, sleeping, going to the bathroom, and wagging her tail when we come home. Over time, we use this visual information to create a picture in our mind of what is normal for our dog. As long as we see all of these things happening, we assume that nothing is off-kilter. Dogs, on the other hand, use their sense of smell as their primary means of gathering information. When they sniff each other (a habit we often find funny or gross) they are actually gathering information. Is she in heat? Is he healthy? What did she eat for breakfast? All these questions and many more can be answered by decoding a dog’s scent. Our puny human noses cannot smell our dog’s illness. Because of our dog’s ability to compensate for their symptoms, our eyes are blind, too. Given all of this, we cannot possibly blame ourselves for not discovering cancer before decompensation occurred. We cannot possibly blame ourselves for not discovering cancer before decompensation occurred. This is a complicated question, and there is no one “right” answer. Let’s start with the most obvious and least controversial answer I have. Some cancers simply are not visible to the naked eye, cannot be felt with the fingers and don’t produce a noise that can be heard with a stethoscope. These cancers are often advanced by the time the dog decompensates and the guardian realizes something is wrong. This can be true for human cancers, too. In deep body cancers, we don’t usually realize something is wrong until after symptoms start to show up. Cancer can take a long time to develop; we’ll talk more about this later. For now, it’s important to realize that cancer does not appear overnight. It just seems to. Cancer does not appear overnight. It just seems to. Some dogs are born with genetic mutations passed on from their parents’ DNA, which can develop into cancer later. This is a very complex subject, so I’m going to vastly over-simplify it. Cancer goes through many steps – for the sake of explanation, let’s pretend it is ten steps – before it is fully developed and diagnosed. If a dog is born with a genetic mutation that predisposes her to develop cancer, she may already be on, say, step three of ten, at birth. If the cancer does develop, it may take years for recognizable signs to appear. To the guardian, that cancer may seem to pop up overnight when, in fact, it developed over the genetic history of the dog. If it were possible to trace the molecular history of that genetic mutation all the way back to where it began in her ancestors, you could even say that in some cases cancer develops over millennia. In some cases cancer develops over millennia. It would be ideal if vets had screening tests that could catch cancer early, but, we don’t. While some human cancers can be found by measuring certain markers in the blood, we can’t do this for most dog cancers. Routine physical exams can uncover suspicious lumps and bumps. Unfortunately, many dog lovers seem to think of the vet like they do a car mechanic: they take the dog in only when something is obviously wrong. Regular physicals are critical for finding cancer as early as possible, but, even they can’t always catch cancers that start on a microscopic level, or are located deep in the body. Regular physicals are critical for finding cancer as early as possible, but, even they can’t always catch cancer. When some vets find a lump during an exam, they recommend taking a “wait and see” approach. They advise the guardian to look for changes or growth before testing the lump for cancer. However, waiting can be problematic. If a lump is cancerous and left untreated, it can spread, becoming much harder to treat later. No one, not even my oncologist co-author Dr. Ettinger, can tell what a lump is without testing it for cancer cells. When I see or feel a lump on a dog, I can often make an accurate, educated guess about whether it is a malignancy. However, I can also make an inaccurate, educated guess. No one, not even an oncologist, can tell what a lump is without testing it. Many vets are hesitant to recommend extensive or expensive testing procedures, because we are sensitive to guardians, who might be thinking that we’re just “running up the bill.” This is especially true if tests come back negative. If you weren’t going to find anything, why did you order that test in the first place? While it’s true that there may be a few vets who run unnecessary tests, it’s impossible to know for certain that cancer is present without at least a fine needle aspirate and/or a biopsy. Metastasis, or cancer spread, can only be confirmed with X-rays or some other imaging test, blood tests, urine tests, and other screening tools, depending upon the cancer’s type. There is simply no way around it – in order to get a diagnosis, we must run tests. So what’s different about cancer? Three things. Cancer is the number one killer of dogs (following euthanasia), according to organizations like the National Canine Cancer Foundation. This is not yet common knowledge among vets. According to estimates, one in three dogs will get cancer, and this increases to one in two in dogs over the age of ten. Those are scary numbers, and not every vet believes they are accurate, because the data is coming from a foundation, rather than a systematic examination of every clinic’s cases. This leads me to the second reason some vets don’t push for early cancer screening. One in three dogs get cancer, and one in two dogs over the age of ten. Most vets don’t yet realize we are in the middle of a dog cancer epidemic. What are the strengths of their study? Were enough animals included in the study to make the results statistically significant? What are they overlooking in their conclusions? Could they be manipulating the data to serve a particular agenda? How was their research funded? By drug companies? By the government? By themselves? Do they have any financial interest in the outcome of their work? Do they have personal bias that might influence their interpretation of the data? It’s easy for vets to read their trade journals and assume that the authors are unbiased. But too often, they aren’t. Like so many of us, veterinarians sometimes blindly trust published literature, rather than looking for bias. It’s also just as easy for some vets to be swayed by marketing from pharmaceutical companies. If you’ve brought a new puppy into your life in the last few years, you may have received a “puppy kit” from your vet. Pharmaceutical companies, dog food companies, and pet product manufacturers regularly provide free “gifts” to veterinarians to hand out to new puppy guardians. Perhaps the folder that held your puppy’s papers was also an ad for a heartworm medication. Perhaps the new doggy toy has the name of a popular dog food printed on the tag. I freely admit to using some of these gifts in my own practice. While it’s wonderful when vets save money and give their clients a gift at the same time, it’s also an implied endorsement of the company’s products. Does it create a potential bias toward using that company’s products? Certainly. Is that bad? Not necessarily. The promoted products have a beneficial purpose that could be lifesaving. However, we should ensure that each vet is aware of her bias, does her own research, and asks those tough questions of the information presented by the companies involved. Veterinarians are swayed by their relationships with pharmaceutical companies. Unfortunately, when it comes to cancer, we have just a handful of conventional tools: chemotherapy, radiation, and surgery. In many cases, guardians consider those tools too expensive and not good enough at extending life, enhancing the quality of life, or providing comfort to the dog. Some vets agree, even if only on a subconscious level. The cure for systemic dog cancer has not been found, at least not yet, by conventional oncology. In general, vets are animal lovers who entered the profession so they could be around animals all day long. Limited tools and dispiriting, confusing statistics make dealing with cancer a frustrating experience for most vets. It is profoundly unsatisfying not to be able to cure a dog with cancer. Vets can be sabotaged by stress, just like any other person. This is another reason why you must step up and advocate for your dog by becoming a fierce dog guardian. Vets can be sabotaged by the stress of not being able to treat dog cancer with traditional tools. You will probably never really know why the cancer wasn’t caught earlier. Perhaps we didn’t look hard enough or often enough, we didn’t use our existing diagnostic tools early enough, or we simply need better tools. Or, perhaps we could have done more, and we still would not have found the cancer. You may never get a good answer to why your vet didn’t catch the cancer earlier. Some questions are just never answered. 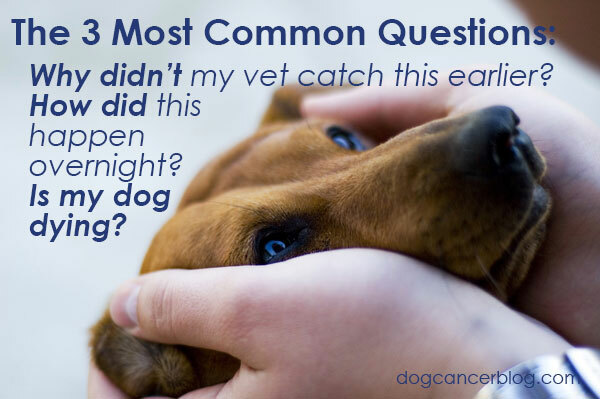 Let’s turn ourselves to the last question dog guardians usually ask when they face a cancer diagnosis. No, he’s not. He’s alive right now, and the healthy cells in his body are operating as they always have. They are living right now. Many of them are even fighting the cancer. If he’s breathing, he’s alive. There is another way to look at it, of course. Here’s another, equally valid answer: this may be a tough pill to swallow, but yes, in a way, your dog is dying right now. Death is inevitable and always has been. It’s an unavoidable part of life on our planet. From this point of view, nothing has really changed, but you may now be more aware of your dog’s eventual death than you were before you received the cancer diagnosis. Or, you may understand that death is inevitable, but are feeling that death is coming too soon. I think most dog lovers feel this way about the possibility of their dog’s death. Whichever perspective feels most comfortable for you, the chances that your dog is going to expire as you are reading this are low. You have time. You may know a woman who had breast cancer, one of the most common human cancers. Perhaps she had no idea that she was sick until a doctor found a spot on her mammogram. Her body appeared healthy, and indeed most of her cells were normal. She didn’t actually feel sick; she had time to get treatment and live a good life. Maybe she even beat the cancer into remission. … I have seen some recoveries that can only be described as miraculous, and I take nothing for granted when it comes to a dog’s ability to heal. There is no way for you to know, right now, that your dog will definitely die of cancer, any time soon. Each dog, each case, is different. That’s why I am so glad that you are taking the time to educate yourself, so you can make decisions that will lead to the best outcome. There is no way for you to know, right now, that your dog will definitely die of cancer, any time soon. So let’s not focus on the when, right? As you’ll learn, your dog’s body is already hard at work, fighting the cancer cells. Remember, cancer is not an immediate death sentence. Cancer is a living process that happens in a living body. And your dog’s body might be better equipped than most to handle the challenges of cancer, just because she is a dog. Dogs live in the moment, and they don’t worry about trying to change things they cannot change. So while your dog may have cancer, the good news is that she isn’t upset about it the way she would be if she were human. We can all be grateful for that! …the good news is that she isn’t upset about it the way she would be if she were human.